The cleansing sweep of GE14 has flushed out the Federal Government and also sent Sabah’s Musa Aman packing. Yet, one glaring piece of unfinished business remaining among various pockets of entrenched corruption is Sarawak and its limpit of a leading politician, Governor Taib Mahmud. Social media over the past two days has buzzed with footage of the ageing Governor, apparently disabled down his right side as he stretches out his left arm from a seating position to great Aid Fitr guests. Taib has dominated the state for nearly four decades, during which he has acquired ownership of much of the local economy, along with estimated billions of dollars of kleptocratic spoils, squirrelled away abroad. He should be got rid of and the money returned. However, signs are the present leadership plans to allow the potentate to remain, at least until Sarawak voters get their say in state elections some way off. Prime Minister Mahathir has been indicating to some that he doesn’t wish to move against a veteran leader, who is plainly becoming frail (also, some note, a key ally from the past). Such indulgence to an elder politician may be generous spirited on a personal level, but many Sarawakians will view the matter differently, not least because the disgraceful poverty, substandard education and insufficient services suffered by so many of the native people in Malaysia’s wealthiest state, owes to the decades Taib prioritised his own bank balances and continuing power over their welfare. Part of Taib’s ‘fragility’, which is delicately being acknowledged, relates to a reported loss of his once razor sharp acumen. Put bluntly, the Governor has become prone to publically forgetting recent events, for example, the fact that an election has taken place. A growing number within the newly dominant Pakatan Harapan party have started murmuring amongst themselves that the state needs a Governor who is on the ball, particularly in this period of transition. Indeed, Taib is also being said to have tested positive for heavy metal contamination: Sarawak is not named after the ancient term for antimony for nothing, as such metals run high in natural water supplies and can exacerbate afflictions such as memory loss or strokes. Many believe that the people must come first in such a situation, as is provided for under the constitution of the state. The present Agong provides an excellent example of this approach, since he himself has replaced his father owing to incapacity resulting from a stroke, despite the fact that his father reportedly remains clear thinking. In the spirit of the new democracy, therefore, the health or otherwise of the present governor needs to be addressed openly, especially given his advanced years. If Taib is unable to show that he has the same remaining verve and mental agility as his older contemporary, the prime minister, then he ought to be retired on these grounds alone. This is not least because, as Taib ails, the tension between the different branches of his sprawling family has broken into an open warfare, which is no secret in Sarawak. This website has not hesitated to put its view that none of the enormous wealth that lies within the grasp of the stupendously rich Mahmud clan has been legitimately obtained. Sarawak Report agrees with very many others that all these ill-gotten riches ought to be nationalised back to the state for health, education and general economic progress from which it was diverted. Amongst those likely to be made happier by such an action would appear be Taib’s family itself, which has been riven by the classic consequences of obscene greed, including family feuds, dissipated lives and general hatred and scheming all round. The lot of them are evidently fighting over who is going to get the lion’s share of Daddy’s loot, whilst some are exhibiting astonishing relative meanness over matters such as divorce and child support settlements to discarded members. Hanifah Taib, the fourth and most ambitious of the offspring, has just succeeded to her father’s old federal seat in Mukah, her new political career somewhat stymied by the fact that PBB is no longer part of the ruling coalition. She has been displaced as her father’s effective consort, following the death of their mother Leila, by the arrival of his brassy second wife, Syrian national, Ragad, obtained through a marriage facilitator in the Middle East. 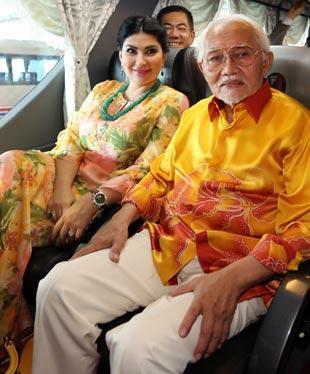 That marriage was seen as a power move by Taib’s other powerful female relative, his sister Raziah, who pursues a business-focused marriage with her third husband, Robert Geneid, who is of Lebanese origin and reportedly brokered the arrangement. However, Ragad, who was still in her late 20s at the time of her union to the septuagenarian she had not previously met, has moved swiftly to establish control over her once fearsome spouse, allegedly elbowing out and alienating his immediate family. The Geneids, and certainly Taib himself, had not been apparently aware at the time of the marriage that not only had Ragad already been divorced twice, but she had two sons from her earlier unions. Having navigated objections over this and other matters, Ragad has now apparently imposed her advantage in physical energy and size and brought into play her skills and her family’s advice to establish a dominant position within the household. Ragad’s own family and various close companions pass a lot of time in and around the Taib family home and over the past months she has managed to secure the adoption of her two sons by Taib, along with ‘native status’ for all three of them. They are now poised to inherit Taib’s fortune equally with his actual adult children and also to engage in land dabbling and other concessions exclusively allowed to ‘natives of Sarawak’. The former issue can only have worsened the rivalry and tensions within the Taib family itself, whilst the later has infuriated just about every denizen of Sarawak. Neither is Ragad’s ostentatious, flashy and flirtatious style perceived as dignified on the arm of the elderly Governor: people find it hard to believe that her heart is really in the job and suspect instead that her eye is on the money. All of which has thrown into sharper focus the pressing matter of a review of the Taib family entitlement to any of that money in the first place. With Taib failing and his offspring and siblings left fuming impotently on the sidelines, Ragad is feared to be readying herself to depart the scene with a hoard that will have made her decade in Sarawak more than worth its while. There are concerns that this political wife now stands between every transaction conducted between the Governor and his once loyal private secretary, to the extent that rumours have circulated that Taib remains incarcerated in a locked room for considerable periods – the key being on the outside of the door. If half the rumours are true, then this Head of State is no longer in control of state affairs nor indeed of his own vast financial empire. All of which is worrying for Sarawak. A starting point for addressing these matters would be for the suspended MACC report into Taib’s financial misappropriations from the state to be re-opened. The matter of the Governor’s physical and mental health and state of independence ought also to be transparently addressed. Since his daughter has now become a public figure, she should come out with a statement of her own position on this matter and assessment of her father’s situation. Meanwhile, the federal government must not hold back from reforming outrageous inadequacies in the anti-corruption legislation brought through by the previous BN government, which has protected corrupted ministers. Under these rules the likes of Taib only had to exit the cabinet roon during the moment decisions were made that benefited them personally, in order to avoid culpability for blatant self-enrichments. That ‘get-out’ needs ending and the money Taib stole needs to be returned in trust to the State of Sarawak.